There’s two ways you could go about solving this problem. 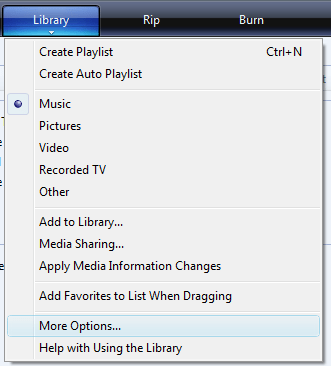 One way would be to create an Auto Playlist starting at Library – Create Auto Playlist in Windows Media Player. You’d then select only tracks you want to hear by genre or other meaningful details about the songs. This first method doesn’t get Windows Media Player to ignore you podcasts. If you really want to eliminate the podcast files from being exposed to Windows Media Player, you need to have the software ignore the folder where the podcasts are downloaded. 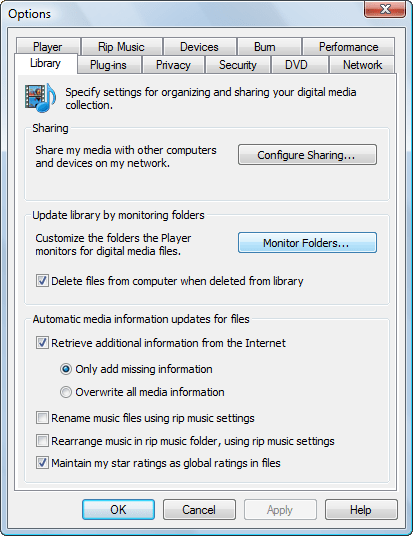 Windows Media Player allows you to choose folders to monitor. It also allows you to ignore folders completely. Start by choosing Library > More Options from the WMP top menu. Next click the Monitor Folders button. Click Advanced Options then select the folder containing the files you want to ignore and click ignore. If the folder is not already in the list of monitored folders because it is a sub-folder of another folder, you might need to add the folder first and then ignore it. Keep in mind that this only works if your podcast files are downloaded to a folder different than the one your music files are stored in. You might need to separate the podcast files to their own folder and change your podcast download preferences in iTunes for this to be a permanent solution to ignoring podcasts when playing back music.